Crystal just returned from her November trip with her daughter who has never eaten in a restaurant due to food allergies. 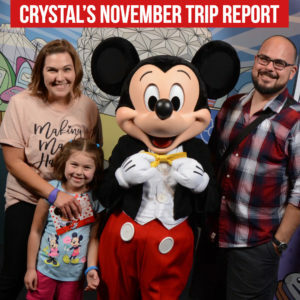 Hear about their trip that included a stay at Bay Lake Tower, Mickey's Very Merry Christmas Party, and hear how Disney handled her daughter's food allergies. I also have a quick tip if you'd like to order from a Table Service menu but don't have a dining reservation. "Did you know that the Table Service restaurants in the park do carry out? Nearing the end of a long day in Animal Kingdom towards the end of our trip we found ourselves without an ADR for dinner. We were tiring of the standard Quick Service fare and not feeling like running across the park for something more unique. As we were near Yak and Yeti, we popped in hoping to snag a table without a reservation but were told it would have been a 30 minute wait. Instead, we ordered 2 adult entrees to-go for our family of 4, and after a short 10-minute wait for them to prepare our food, we walked out of the restaurant with our meal. The open seating of the Yak and Yeti Local market (Quick Service) was right next door and nearly empty, so we were easily able to snag a table and enjoy our meal. So my tip is to consider ordering carry out at times when you didn’t plan for an ADR. The cost of the two adult meals was similar to what we would have paid for 2 adult and 2 kid quick service meals and was plenty of food for us all. " Just wanted to say I am from Western NY also so it’s nice to hear from someone local!! We’re leaving for a WDW this weekend, so I’m loving listening to your trip reports to get excited and learn a little bit more! I have a question about the takeout food tip – do you think that all WDW table service restaurants will do this? Or could it be because Yak & Yeti is actually a Landry’s restaurant (like Rainforest and T-Rex) so they operate differently? I know you can sit at the bar at Y&Y and order from the full menu too. Even if it is just at some locations, I can definitely see us using this tip at AK because we’ll have two toddlers with us and aren’t planning to do many sit down meals. This would be a great way to get some good food even if the kids don’t want to sit! So thanks for the trip report and the tip!